Today we’re bringing you a video from our workshop on wiring half-switched outlets. A half-switched outlet is an outlet where either the top or bottom half of the outlet is controlled by a switch, while the other half is always on. 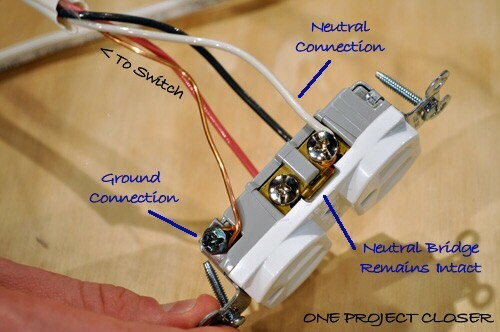 This outlet configuration is common in homes built in the 1980s, when this method of wiring reached peak popularity. This video explains one wiring approach for creating a half-switched outlet to help you either diagnose or create this configuration in the future. In this example, the power comes from the breaker panel, then to the switch box, and then on to the outlet. After the video and a few pictures, I explain an alternative method that can be used to achieve a half switched outlet when power comes to the outlet first. If the video moved too quickly, these pictures should make the wiring setup clear. In the approach in the video, power enters first at the switch. If power enters first at the outlet, it is possible to achieve a half-switched outlet by branching a switch wire. This is achieved by running two-wire cable from the outlet box to the switch box. Power leaves the outlet box on the white wire (which should be wrapped with black or red electrical tape to indicate that it is being used to carry “hot” to the switch”), then in the switch box the black and white wires are connected to the switch, effectively making the black wire “switched hot”, which runs back in the same cable to the outlet. 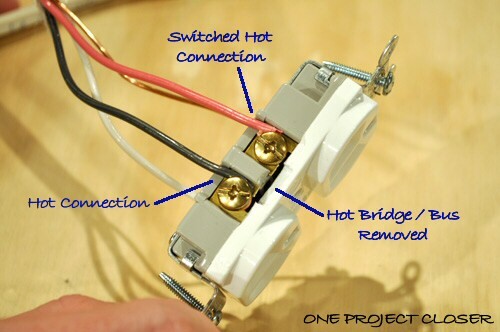 Using some pigtails, you can attach both hot and switched hot to the top and bottom of the outlet. 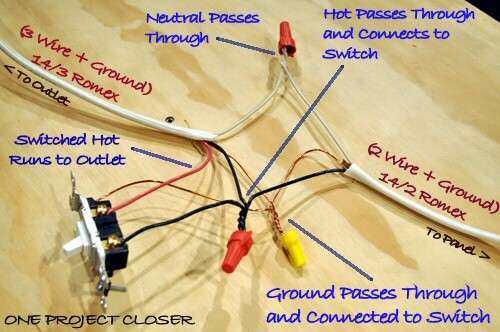 Dave Rongey has a decent set of wiring diagrams for both methods of half-switched wiring. (There are a number of ads on this page… but I did think Dave’s drawings were a very good look at both wiring methods.) Note that recent changes in the National Electrical Code require a neutral wire be present in all switch boxes, which means the alternate method (where power enters into the outlet rather than the switch) is no longer acceptable, unless three-wire cable is run from the outlet to the switch, which provides no cost savings, and so isn’t a great solution. We’ve never seen a situation where a single outlet is placed on two completely different circuits (controlled by different breakers); however, you should know that someone could wire an outlet this way, even though it may violate code. The cable shown here is 14/2 and 14/3 NMB cable, suitable for most indoor wiring. 14 gauge wire is required for 15 amp circuits. Thicker 12 gauge wire is required on 20 amp circuits, such as those usually found in kitchens. See the Related Content section below for additional useful articles on electrical outlets. Need to work on the shop acoustics to kill that echo lol. Great video though. Hope this is going to become a regular thing. Its always easier to see it done than to read about it and look at a few pictures. Jake you are absolutely correct on the echo. Our camera won’t take a mic input, but we’re eventually going to get a better camera that will, and use a lapel mic which should work much better. Good idea using a video on this one. Are their any outtakes of someone getting a slight shock? This is very useful in reading areas and studies where you want easy access to turn on accent lighting (lamp) without reaching for it all the time. Helped my father, an electrician, wire many of these in apartment buildings, and often thought they would be initially quite confusing to tenants, as in ” Why does my alarm clock turn off when I flip that switch?”. In the upper photo of the wiring of the switch, I think it would be good if you wrote “from the panel” instead of “to the panel” (lower right hand side of image) to illustrate the direction of travel of the current along the black conductor.